Despite various technological advances and detailed legislation, hot water safety is still an issue in the UK. In public buildings this concern is intensified, as there is potential for vulnerable people to use the washroom facilities. Chris Tranter at Bristan explains why it’s crucial to specify bathroom products that address the issue of hot water safety and reduce the risks. When it comes to hot water safety, washrooms pose two main concerns for public building managers — the potential build-up of dangerous bacteria such as Legionella, and scalding, which is an NHS designated ‘Never Event’, meaning it should never occur. Legionella bacteria are responsible for Legionnaires’ disease, often contracted by the most vulnerable patients, through the inhalation into the lungs of small droplets of water. It is generally accepted that the source of this bacteria in hot and cold water systems is from the incoming water supply. Legionella outbreaks, whilst relatively infrequent, can have disastrous consequences when they occur. Recent examples include Paulton Birth Centre in Somerset, which was closed in March this year after a strain of Legionella bacteria was found in the water system. Last year, Brighton and Sussex University Hospital NHS Trust was fined £50,000 for failing to control Legionella, following the death of a vulnerable cancer patient where Legionella pneumonia may have hastened her death. Furthermore, a recent inquest found that a patient being treated for leukaemia at Bath’s Royal United Hospital in July 2015 died from Legionnaires’ disease, contracted from a malfunctioning water supply and distribution system. The primary method of eliminating Legionella lies in how hot water is stored. Legionella bacteria are most commonly found in water, whereby they multiply when temperatures are between 20-45˚C. As such, water must be stored at 60˚C or above to limit growth and all outlets must be regularly flushed to prevent any internal build up. However, allowing water to reach a tap at 60oC poses some serious risks, which need to be carefully weighed up. According to the HSE document Managing the risks from hot water and surfaces in health and social care: ‘Engineering controls should be provided to ensure that water hotter than 44oC is not discharged from outlets that may be accessible to vulnerable people and where there is potential for whole body immersion. Similar controls may be needed at other outlets where people are especially vulnerable (e.g. basins where people have skin sensitivity impairment)’. Water stored at high temperatures constitutes a very real danger of severe scalding, and in extreme cases, third degree burns, which can occur in just five seconds. Almost 600 people a year are seriously injured from scalds caused by hot water, and burns and scalds remain the fourth leading cause of injury and death for children across the European Union. Any manager of a public building, whether it’s a school, hospital or town hall, has a duty of care to minimize the chance of Legionella colonising whilst also ensuring visitors and residents are protected from scalding. In terms of balancing these twin hazards, one of the most effective measures is to specify products with an in-built TMV (thermostatic mixing valve), or, alternatively, an ancillary TMV. TMVs allow water to be stored and distributed at a high enough temperature to kill harmful bacteria, but reduce it to a safe temperature at the point of use by mixing it with the cold supply — and are able to maintain a recommended safe water temperature of between 37 and 46oC, depending on the application. 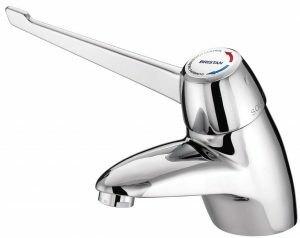 Products such as Bristan’s Solo T3 basin mixers, with TMV3 control, are ideal for public washrooms such as those in schools and healthcare facilities, where it is of paramount importance to ensure scalding risks are kept to an absolute minimum in order to safeguard vulnerable users. Whilst scalding incidents most often involve bathing, showering facilities pose a safety concern too. 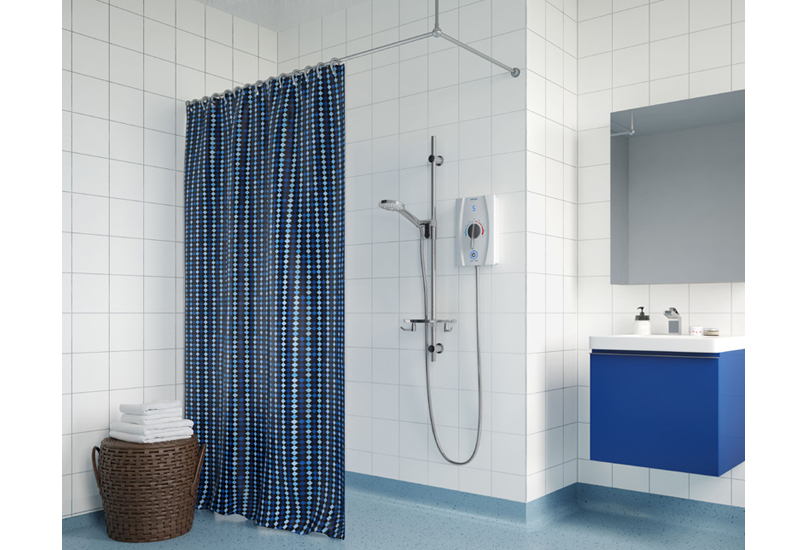 Fitting showers with an inbuilt thermostatic control will significantly reduce the risk of scalding. Models with TMV control will automatically shut off in the event of a hot or cold water supply failure. What’s more, certain products have a factory set temperature, eliminating the possibility of the user selecting an unsafe temperature, which can only be overridden by the operator to a safe maximum temperature. Adequate hot water safety is an essential consideration when it comes to fitting taps and showers in public washrooms. By choosing products, which reduce the hazard of scalding whilst also addressing the dangers of water-borne bacteria, the wellbeing of users can be easily protected.